Guiding students competently through complex theoretical and conceptual issues, the book is careful to ground its discussions in contemporary concerns, such as the War on Terror and its legacy, the ‘securitisation’ of human rights, the Arab Spring, the global financial crisis, contemporary challenges to global institutions, and ethical dilemmas that arise in negotiating gender issues and politics in a culturally diverse world. Each chapter features questions for reflection, seminar activities, further reading and web links to highlight key points and provide contemporary illustrations. A glossary of key terms is also included for easy reference. 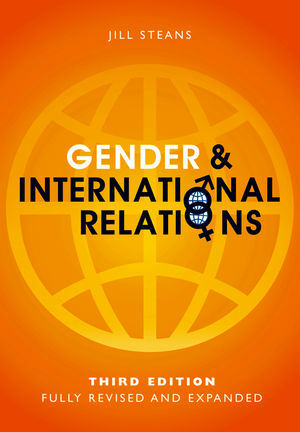 Gender and International Relations will be essential reading for students and scholars of gender, international relations, global politics and related courses. "An excellent and accessible survey of an increasingly complex field, outlining and contextualizing the debates in a way that is sure to provide students and lecturers with the tools needed for deeper exploration of the issues." "Encourages political scientists with more mainstream leanings to think about these concepts in a non-traditional way - there is much to learn and enjoy in this text." "Fully revised and refocused on 'theory, practice and policy,' this edition of Steans' already popular text is the best yet. She expertly synthesizes recent scholarship, bringing us up to date on 'gender and IR' while expanding discussion of emerging issues. In addition to the accessibility, coherence and comprehensive coverage we have come to expect, Steans provides new pedagogical features that will be welcomed by students and teachers alike." "Accessible and comprehensive as it is innovative, this new revised text is well crafted, simultaneously raising nuanced issues about gender and IR, and in an accessible manner for the student of the 21st century. Its clarity and its illustrative materials bring gender and IR to life. Combining major theories of international relations with multidisciplinary approaches to the study and practice of gender, this text provides students with critical tools necessary to understand and creatively assess the gendered effects of the complex forces shaping our world today." "This book synthesizes the ever growing debate on how immensely gender matters in international relations. It covers the depth and breadth of gender-aware IR scholarship, feminist and non-feminist alike, and brings to light its important contributions to understanding political practice and to theory building. Jill Steans provides all this information in a delightfully accessible way. Students who are curious about how the world works will find a lot of first class answers in her book."